From our first enquiry through to the fitting, we received good communications, a positive & professional approach and wardrobes manufactured from high quality materials. Superb all round and highly recommended. Thanks to you all collectively as a team. See you in the New Year…after we save up! Susan and I want to say thank you for the excellent fitting of our study. It has made a tremendous difference to the room. Thanks also to your team of Toby, Teresa and Dawn for all the support work. We are both delighted with it and so pleased with the quality, it is everything we wanted. 5 star reviews from Thompson Local ! sloping ceiling. Was so impressed with the quality and price that I had my room fitted." "After visiting various different companies, I came across a local firm called M&K Designs. They planned designed my robes better than I could have ever imagined !" Thank you for everything that you have done, we love our new storage unit ! and finish it second to none. Really pleased with the wardrobes and drawers. Fabulous job, going for bedside drawers and headboard to match. Fitted wardrobes by M&K very professional, over the moon with the job! We are delighted with the wardrobes & now the carpet has been layed it looks lovely. People who have seen them are asking where we got them from, so heres hoping you get some orders from this. My Wife and I would like to thank you Mark on a wonderful job of our fitted wardrobes. Thank you so much for our beautiful wardrobes. We are so pleased with them ! We would like to wish you all a lovely Christmas. M & K bedroom designs, have done a fantastic job for us, right from when we decided M & K were the best company to Carry out our bedroom design and installation, they listened, were understanding of our proposals and carried out the design and installation fully in accordance with our specific instructions and they also added value with their wealth of experience of bedroom design and installations over many years. The design and planning fully explained what we could expect and their good communication helped us understand the timescales for delivery and installation of the bedroom, we were then able to coordinate our decoration and carpet fitting around these timescales without any problems arising. When there was an issue we were kept informed and Mark personally came and resolved it promptly, he and his team did an excellent job and we would certainly recommend this company to anyone, the works were competitively priced and the Customer service throughout the project was second to none. Just had sliding doors fitted. Over the moon with them & with the service & most important the quality and price! Will be getting more done. Thank you Mark & Vanessa! M&K Designs offered the complete package. Mark is professional and detailed yet friendly and approachable. From design to fitting, the service has been excellent . A truly professional job with no compromise. You were very friendly ,courteous and patient with us deciding what we required and gave us plenty of time to decide. 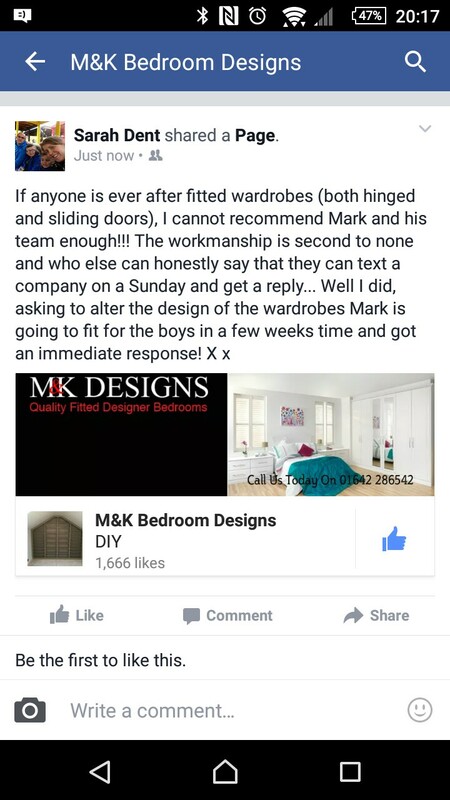 I can honestly say i hesitated about M&K Designs installing my new fitted wardrobes as they had no showroom in place at my time of choosing them for my 3rd storey angled ceiling bedroom but when Mark designed my bedroom and showed me the quality of materials involved i had no hesitation in choosing them. Totally designed around me and exactly fitted to how i wanted, to the highest possible standard. Just to say we are delighted with the sliding door built in wardrobe at our property in Whitby. I wanted to provide some feedback for you to include on your website…….. When I recently wanted to convert a bedroom into a walk in wardrobe, I trawled the Internet looking for a company to carry out the work. I selected M&K Designs based on website testimonials and the fact that they are a local company and I have to say I am so happy that I did. It is sometimes a concern that testimonials are carefully selected and do not give a true reflection of the general service provided. Happily this is not the case with M&K Designs. The service that I received was exactly as described by other customers. They took care of everything, from the initial design visit right through to re laying the carpet after the wardrobes were all installed. The quality of the work and attention to detail is excellent and the final result is far better than I ever envisaged. I would certainly use them again and would have no hesitation recommending them to others.